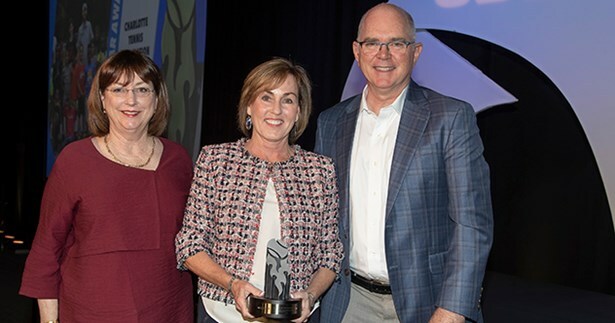 Pictured above: Eleanora Mauritson, USTA Awards Committee Chair; Charlotte Tennis Association Executive Director Carla O'Connor and USTA Chairman of the Board and President Patrick Galbraith. WHITE PLAINS, N.Y. – The United States Tennis Association (USTA) today announced that the Charlotte Tennis Association was selected as the Community Tennis Association (CTA) of the Year. The organization was honored at the USTA Annual Meeting and Conference, March 22-25, at the JW Marriott in Austin, Texas. The Charlotte Tennis Association is a non-profit, USTA-registered community tennis association serving the Charlotte area. Its mission is to promote and develop the growth of tennis in Greater Charlotte by providing access to a full range of tennis programs and activities and creating opportunities to enjoy the social, physical and health benefits provided by the sport of tennis. Since 1991, the Charlotte Tennis Association has grown not only in membership, but in community outreach, offering programs and events that provide play opportunity. These programs include offerings for youth and adults across all ages, ability levels and backgrounds, including junior and adult, school, community outreach, enrichment and adaptive programs. The organization has also developed a public tennis complex in Charlotte to provide greater access to the sport. The new facility will serve as a home for several outreach tennis programs. The USTA CTA of the Year Award was established in 2002 to honor a CTA for outstanding service in growing and developing the sport of tennis in its community. The award recipient is selected from 17 nominees, one from each of the USTA sections, by a panel of USTA Community Tennis Association Development Committee members. The USTA Annual Meeting and Conference brings together USTA leadership, national staff, national committee members and section volunteers and staff in pursuit of the USTA mission: to promote and develop the growth of tennis. Along with leadership and committee meetings, the Annual Meeting provides educational opportunities for all attendees to develop and enhance their personal and professional skills and learn new ways to promote the game of tennis.